Ind. loc. : China / 中华; Gansu / 甘肃省, Lanzhou / Lanchow / 兰州市. Holotypus / Holotype: J.Z. Liu & Y.J. Sun 215 (LZU). PE 00032934 (isotype). Designated by: Zhi Y. Zhang in Bull. Bot. Res., Harbin. 4(4): 114 (1984). Host: "Nitraria [Nitrariaceae] and Haloxylon [Chenopodiaceae] (Grubov 2001)" (C. lanzhouensis in FloraGREIF - Virtual Flora of Mongolia). Comments: Peng & Wang, 1996: 94 t. 67 f. 1-3 (C. sinensis) vs. 1996: 95 t. 68 f. 1-7 (C. lanzhouensis [C. ningxiaensis]). "本种接近沙苁蓉 [This species is close to] C. sinensis G. Beck，但花萼不整齐5深裂至近基部，裂片不等大，线形或线状披针形；花冠浅黄色；干后变浅棕色而易于区别。" (C. lanzhouensis in frps.iplant.cn). "Calyx 5-parted, lobes unequal; corolla lobes pale brown-yellow when dry (C. lanzhouensis) / Calyx 4-parted, lobes subequal; corolla lobes dark blue when dry (C. sinensis)" (Zhang & Tzvelev, 1998). However, we believe that more research is needed to establish their morphological and host differences. Ic. : a, Peng & Wang, 1996: 95 t. 68 f. 1-7; b, Zhang & Tzvelev in Flora of China 18: t. 256 f. 9-11; C. lanzhouensis in frps.iplant.cn et FRPS 69: 88, t. 23 f. 8-9. 1990; Zhang, 1990: t. 2 f. 1-3 [pollen]. Distribution: China and Mongolia: "Slopes. Gansu, S Nei Mongol, Ningxia [S and E Mongolia]" (Zhang & Tzvelev, 1998). Gansu / 甘肃省 / Kan-su / Kansu / Kan-suh (Zhang & Tzvelev, 1998). Lanzhou / Lanchow / 兰州市 (PE 00032934 / PE - 94623 - 00032934, isotype). Dornogovi Province / Дорноговь аймаг (East Gobi) / 东戈壁省 / Восточно-Гобийский аймак: "Phelipaea lanuginosa C.A. Mey / N. 1063. 1.VII.1926 ... [Сайншанд сум / Sainshand ?] / С. Кондратьев [S. Kondratyev] " (MW 0190447; rev. Ó. Sánchez Pedraja Mar 2019); "Cistanche feddeana Hao / Монголия, Восточно-Гобийский аймак Урген район [Örgön District] ... 5.VII.1975. N. 582a Собр. О. В. Журба [O.V. Zhurba]" (MW 0190450; rev. Ó. Sánchez Pedraja Mar 2019); "Cistanche feddeana Hao / Монголия, Восточно-Гобийский аймак Урген район [Örgön District] ... 5.VII.1975. N. 582b Собр. О.В. Журба [O.V. Zhurba]" (MW 0190449; rev. Ó. Sánchez Pedraja Mar 2019); "Cistanche feddeana Hao / Монголия, Восточно-Гобийский аймак, 280 км на 10103 от г. Сайн-шанд [Сайншанд сум / Sainshand District] ... 22.VI.1980. Nº 5642 Собр. И.А. Губанов [I.A. Gubanov]" (MW 0190453; rev. Ó. Sánchez Pedraja May 2018 [corolla lobes pale brown-yellow when dry (Zhang & Tzvelev, 1998)]); "East Gobi: - Tract Kalganskij [Калганский тракт / Kalgan (Zhangjiakou / 张家口市,) highway], ridge Dologelut (Pob. 20.08.1931). (Grubov et al. 2006: 13) – Dornogov: Balarin-khuduk (Balariin Hudag 46°14' N 110°15' E) along way way from Alashan (= Dongsheng [Ordos City, Inner Mongolia, China]) to Urga (= Ulaan-Baatar [Ulaanbaatar / Улаанбаатар]), on sand (Tschet. 16.05.1909). (Grubov et al. 2006: 14 sub C. ningxiaensis) – Dornogov Aim. : Naran-Mandakh sum [Mandakh District / Мандах сум] (44,406 N 108,252 E), tract Dzagiin-Khuduk, 30 km N of sum, depression (Junussov 05.06.1941). (Grubov et al. 2006: 14 sub C. ningxiaensis). - Ibidem, 15-19 km SE of Dobusan-Eligen-khuduk [near Mandakh District / Мандах сум] (Junussov 07.06.1941). (Grubov et al. 2006: 14 sub C. ningxiaensis)" (Uhlich, 2014: 3, sub C. lanzhouensis); "12 [East Gobi] (Khar Sukhai), (Tzvelev 2006)" (Urgamal & al., 2014: 193, sub C. lanzhouensis); "12 [East Gobi] (Mandakh sum, Zagiin khudag), (Tzvelev 2006)" (Urgamal & al., 2014: 193, sub C. ningxiaensis). Govi-Altai Province / Говь-Алтай аймаг / 戈壁阿尔泰省: 13 [Gobi Altai mountain semidesert steppe] by Grubov, 1982, sub C. feddeana (Urgamal & al., 2013, sub C. feddeana; Urgamal & al., 2014: 193, sub C. feddeana). Khovd Province / Ховд аймаг / Кобдоский аймак: Munkhkhairkhan mountain [Мөнххайрхан уул] (Altai mountain system) ["Table 2. List of newly recorded species in two phytogeographical regions of Mongolian Altai (MA) and Dzungarian Gobi (DG)."] (Batlai & al., 2017: 577, sub C. feddeana). Ömnögovi Province / Өмнөговь аймаг / Южно-Гобийский аймак / Умнеговь / 南戈壁省: 16 [Alashan Gobi desert] by Grubov, 1982, sub C. feddeana (Urgamal & al., 2013, sub C. feddeana; Urgamal & al., 2014: 193, sub C. feddeana); "Alashan Gobi: - Ömnögov Aim. : tract Kobden-obot [Alash Gobi (Kobden-Usu between Gashiun lake and Tostu mountain range / Obot-Khural settlement, desert 10 km east of Tsailyan border post] N of lake Gaxun-Nur [salt lake Juyan Lake / 居延海 / Gashuun Nuur, Alxa League, Inner Mongolia, China] (Pot. 13.08.1886). (Grubov et al. 2006: 13 f.)" (Uhlich, 2014: 3, sub C. lanzhouensis). Sükhbaatar Province / Сүхбаатар аймаг / 苏赫巴托尔省 / Сухэ-Батор / Сухэ-Баторский аймак: "Cistanche feddeana Hao / ... Сухэ-Баторский аймак Баяндэлгэр сум [Bayandelger]... 5.VII.1975. N. 582 Собр. О. В. Журба [O.V. Zhurba]" (MW 0190448; rev. Ó. Sánchez Pedraja Mar 2019); "Cistanche feddeana Hao / ... Сухэ-Баторский аймак ... 15 км на С3 ... Онгон [Ongon Sum] ... 15.VII.1978 Собр. Огуреева Г.Н. [Ogureyev G.N. ]" (MW 0190451; rev. Ó. Sánchez Pedraja Mar 2019). Batlai, O., Shukherdorj, B., Khurelpurev, O., Oyunbileg, M., Kim, J.Y., Cho, H.J., Nyam-Osor, B., Chung, G.Y. & Choi, H.J. 2017. Contribution to the knowledge on the flora of Munkhkhairkhan mountain area, Mongolia. J. Asia-Pacific Biodivers. 10: 573-582. DOI: https://doi.org/10.1016/j.japb.2017.05.005. Chinese Virture Herbarium (CVH). 2004-2013. Orobanchaceae. Cistanche sinensis. URL: http://www.cvh.ac.cn/ - http://www.cvh.ac.cn/en - http://www.cvh.ac.cn/cnpc/Cistanche%20lanzhouensis - http://www.cvh.ac.cn/spm/PE/00032934 (accessed Sep 2016). FloraGREIF - Virtual Flora of Mongolia. Virtual Guide to the Flora of Mongolia - Plant Database as Practica Approach. Cistanche. Cistanche lanzhouensis. [Search Plant Database]. University of Greifswald, Institute of Botany and Landscape Ecology, Institute of Geography and Geology, Computer Centre, 2010- (continuously updated). Computer Centre of University of Greifswald, D-17487 Greifswald, Germany (accessed Mar 2019). FRPS 69. 1990. Flora Republicae Popularis Sinicae [Delectis Florae Reipublicae Popularis Sinicae] 69: 83-89 [FRPS 69: 84 1990]. Agendae Academiae Sinicae Edita [FRPS. Anonymous 1959-1998. 80 vols.] (Chinese). URL: http://frps.iplant.cn/pdf/69/084a.pdf. GBIF (The Global Biodiversity Information Facility). GBIF Online Resource Centre. Search. Cistanche lanzhouensis - Cistanche feddeana. URL: https://www.gbif.org/species/3730638 - https://www.gbif.org/species/3730687 (accessed Mar 2019). Grubov, V.I. [Грубов, В.И.]. 1982. Key to the vascular plants of Mongolia (with an atlas) [Определитель сосудистых растений Монголии (с атласом) / Монголын цоргот ургамал таних бичиг (зургийн хамтаар)] Nauka, Leningrad, 443 pp. Gubanov, I.A. 1996. Conspectus of the flora of Outer Mongolia. Moscow, "Valang" Press, 136 pp. Hao, K.S. 1934. Plantae novae Sinicae. I. Repert. Spec. Nov. Regni Veg. 36: 222-224. Seregin, A.P. (ed.). 2018. Specimen MW0190453... from the collection "Moscow University Herbarium" // Depository of Live Systems (branch "Plants"): Electronic resource. – Moscow State University, Moscow. URL: https://plant.depo.msu.ru/open/public/item/MW0190453... (accessed Mar 2018). Tzvelev, N.N. 2006. Orobanchaceae. In: Plantae Asiae Centralis 15. Moskow, Russia, pp. 11-24. (Russian). (Urgamal & al., 2014). Uhlich, H. 2014. Checklist of Orobanchaceae in Mongolia. DOI: https://www.researchgate.net/publication/271270173. Urgamal, M., Oyuntsetseg, B. & Nyambayar, D. 2013. Synopsis and recent additions to the flora of Mongolia. Proc. Inst. Bot., Mongolian Academy of Sciences 25: 53-72. URL: http://www.academia.edu/7698759/SYNOPSIS_AND_RECENT_ADDITIONS_TO_THE_FLORA_OF_MONGOLIA. Urgamal, M., Oyuntsetseg, B., Nyambayar, D. & Dulamsuren, Ch. 2014. Lamiaceae-Menyanthaceae. In: Sanchir, Ch. & Jamsran, Ts. (eds.). Conspectus of the vascular plants of Mongolia. Ulaanbaatar, Mongolia. "Admon" Press. 334 pp. (pp. 158-187). URL: https://www.academia.edu/33088481/Lamiaceae-Menyanthaceae_in_Conspectus_of_the_vascular_plants_of_Mongolia_2014_.pdf. Zhang, Z.Y. 1984. 中国列当科的研究(一) / Studies on the Family Orobanchaceae of China (I). 植物研究 / Bull. Bot. Res. 4(4): 110-119 (in Chinese with English abstract). Zhang, Z.Y. 1990 [10 Jul 1990]. Studies on the pollen morphology and seed coat of the genus Cistanche (Orobanchaceae) in China. Acta Phytotaxon. Sinica 28(4): 294-298. [J. Syst. Evol. 28(4): 294-298 (Abstract- Full Text pdf)]. Zhang, Z.Y. & Tzvelev, N.N. 1998. Orobanchaceae. Cistanche. Cistanche lanzhouensis. In: Flora of China 18: 229-243. 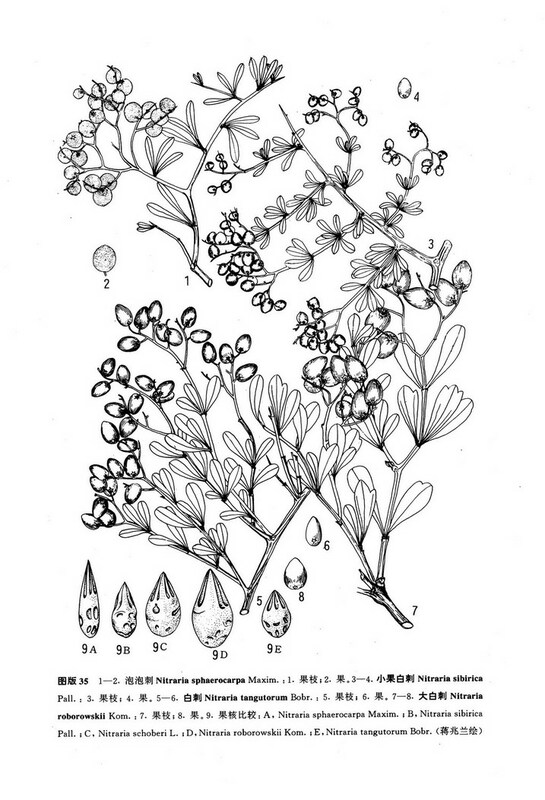 URL: http://www.efloras.org/florataxon.aspx?flora_id=2&taxon_id=200021455 (accessed Aug 2009). Zhang, Z.Y. 2000. 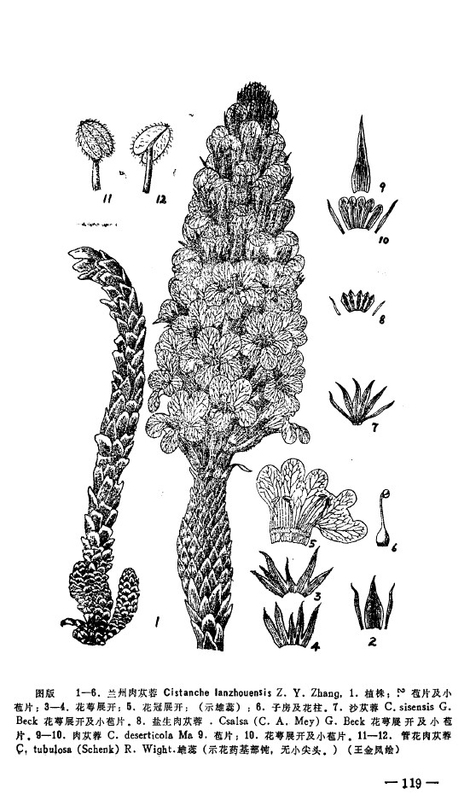 Taxonomy of the Genus Cistanche (Orobanchaceae) in China. The Journal of Pharmaceutical Practice 18(5): 336-337.